Looking at the history, present, and future of Walt Disney World, while sharing sensible suggestions to make your next visit pleasant and productive. 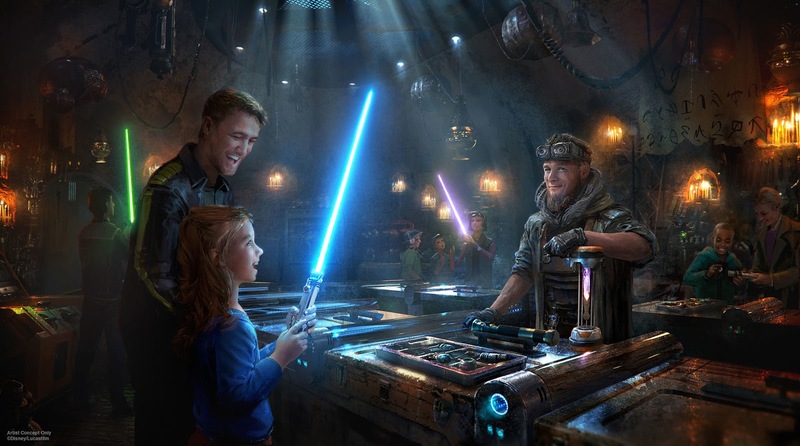 Disney recently invited quite a few media outlets to visit Star Wars: Galaxy's Edge in Anaheim and in the process shared quite a few details about what the new land will look like in Disneyland and Disney's Hollywood Studios. We're working to consolidate that information into some easy to understand videos about what you'll find when you visit the new lands, but in the meantime, if you want to have a look at some of these reports, here's some of what's been written (with a bunch of new photos). We'll keep this up to date as we find more articles. We'll start with Disney's official releases. This is a list of the firsthand accounts of visits to Galaxy's Edge during the recent media previews. Enjoy + let us know if you come across any other firsthand accounts from the recent press visit that aren't listed above! 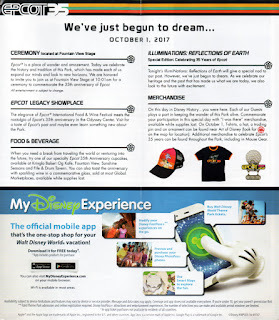 To celebrate Epcot's 35th anniversary on October 1, 2017, the RetroWDW podcast invited their listeners and anyone else who follows them on social media to join the podcast's hosts on a walking tour of Future World in Epcot. The tour was free of charge, scheduled during a break in the D23 Fanniversary that day. The tour began shortly after 3:15 PM underneath Spaceship Earth. 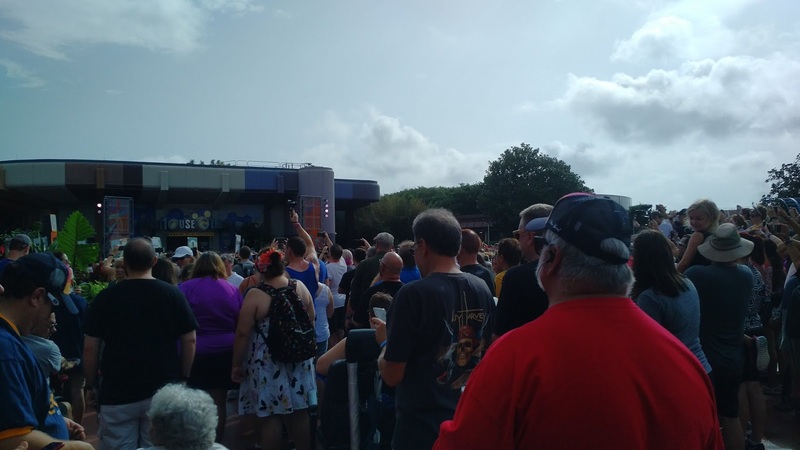 RetroWDW hosts Todd McCartney, How Bowers, Brian Miles, and JT Kuzior took turns sharing stories from their personal knowledge and research, along with some new stories they learned from the D23 events that weekend. While you would've needed to join the tour to hear all the stories, I'll share a few things that I found noteworthy. The first topic of the day was the Epcot entrance fountain, which we learned took a circuitous route to arrive in Epcot, traveling over 8,000 miles across the country. Given the less than 3,000 mile width of the continental United States, that seems a lot farther than one would expect to travel from any given point in the country to Florida, but was required because the weight of the fountain made it too heavy to travel over bridges. We also spoke about the acrylic sculpture that used to sit in the center of the entrance fountain. Over time, it developed small cracks and began to discolor, which led to its removal from the park. Fortunately, having attended the RetroWDW Looking Back At Tomorrow event the night before, I now have my own miniature version of that statue to remember what it used to look like (and you can see for yourself how that miniature was made). The group moved on to the second stop of the tour, just outside Guest Relations, which was once home to a bank of World Key kiosks. 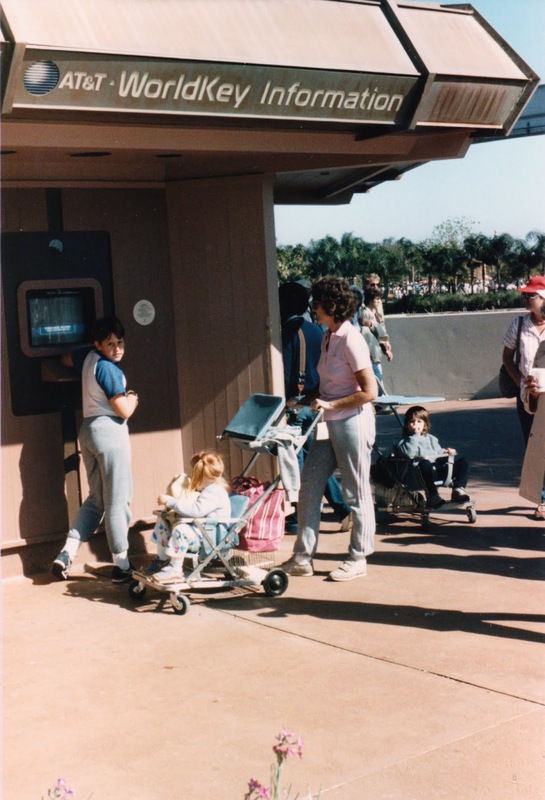 Those machines once served as interactive guides to the park, though they were best known as the places guests would make same-day dining reservations in EPCOT Center, via video conference with a Disney Cast Member. We also discussed how the current Guest Relations was originally part of Communicore, and how today you can still see the windows to what was once a UNISYS corporate lounge inside Guest Relations. Our hosts also pointed out a functioning mailbox that still exists inside the park, right next to the abandoned World Key kiosks outside of Guest Relations. We stopped outside Mission: Space to visit the planter that once held the sign for the Horizons attraction. How Bowers described this as, "the last original piece of Horizons" (though, later that day the RetroWDW folks saw another piece of that attraction in use today inside Spaceship Earth, where a Smellitzer from Horizons has been put into service). 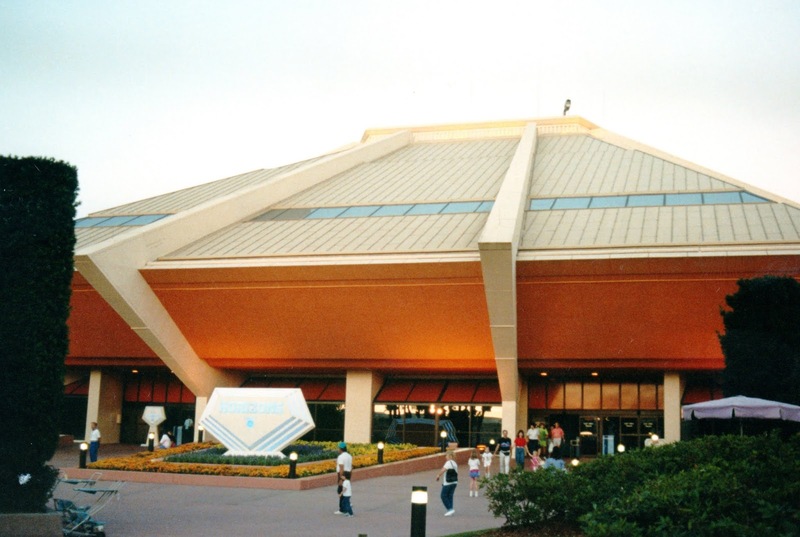 If you look closely, you can see the planter is shaped like the distinctive looking Horizons attraction building. Long before the Internet brought us news from around the world at a moment's notice, the idea of seeing what was going on somewhere else on the planet was quite a novelty. Communicore in EPCOT Center featured the Electronic Forum exhibit, which included the News Choice Theater, showing television broadcasts from different parts of the world. This necessitated a collection of large satellite dishes to bring the live signals to guests in Florida. Todd McCartney showed us this location, outside what was once Communicore East. This nondescript wall once held a scrolling marquee on the outside of the Communicore East building. Apparently, these signs were installed without any thought of how maintenance were to change the light bulbs when they needed to be replaced. Eventually, a special device was built to facilitate changing the bulbs, but that wasn't the only time operations dealt with this sort of problem, as the lights above the Information Fountain inside Communicore West could only be accessed by a somewhat precariously-placed ladder over the fountain. 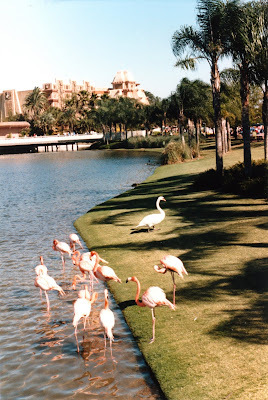 This sinkhole turned small lake near the Odyssey restaurant and the Mexico pavilion was once the location of a family of flamingos. 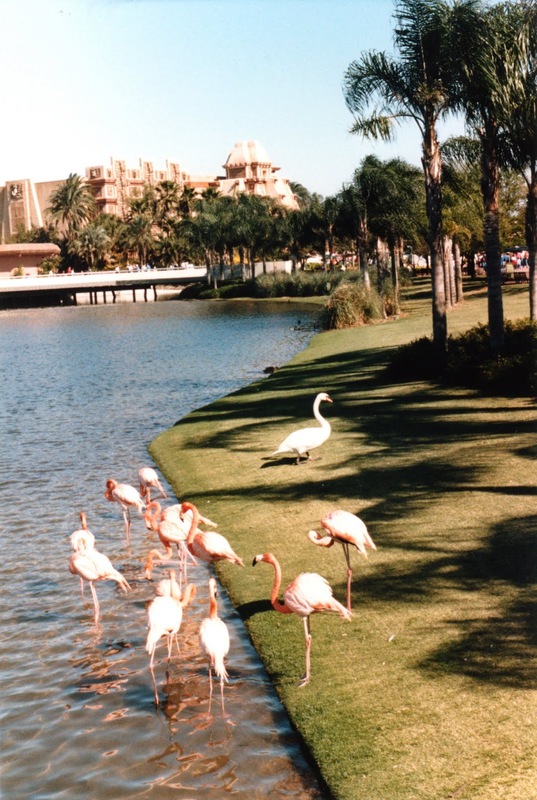 Brian Miles described how that flock was later relocated to Disney's Animal Kingdom and can still be seen today near the end of Kilimanjaro Safaris. We also talked about the Odyssey's days as a quick service restaurant, while also learning that it also hosted a character meal at one point. Our tour continued to the other side of Future World, where we stopped to discuss the room that once held exhibits celebrating Epcot's 25th anniversary. From what our hosts had heard, some of those displays were still visible in that room, walled off from the general public, until the space was selected to be used as the Light Lab during this year's International Food & Wine Festival. We also talked about the location of Epcot's version of the Magic Kingdom Utilidors, where a trash vacuum runs under Communicore. We moved toward the Imagination pavilion, where we stopped near the fountain that flows upward. We learned the sculpture above the fountain has changed from what was originally installed in the park and that the original design for that sculpture was copied from one found on a Kodak company playground. On another Kodak-related note, since that company no longer sponsors the Imagination pavilion, what was once their corporate lounge is now being used as offices for Walt Disney Imagineering (though, I've also read those offices are used by Future World East management). One of the younger guests on our tour was eager to point out the spot where Figment signed the concrete on the ground outside the Imagination pavilion. Do you know where this can be found? 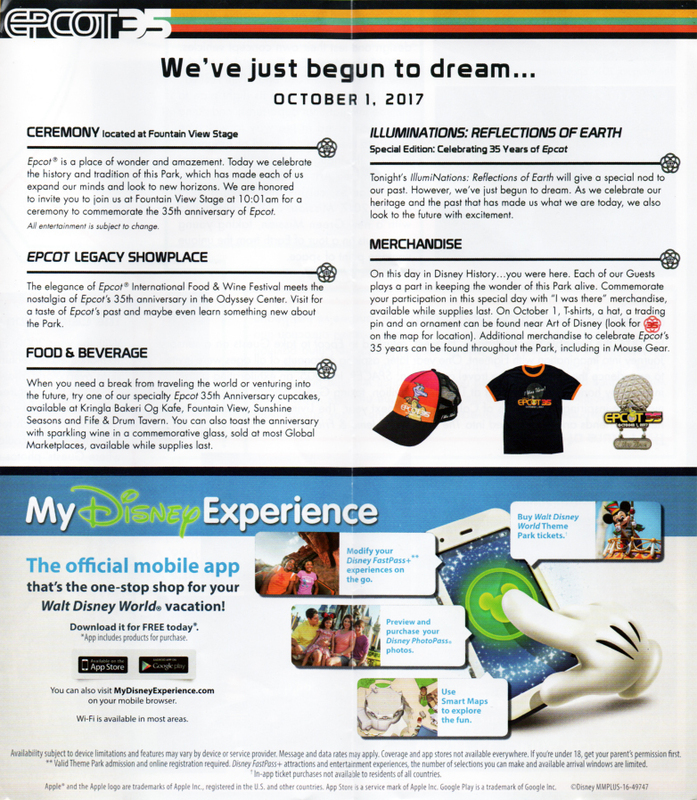 Before making one last stop at The Land, the group gathered for a discussion of several topics, including Tony Baxter's concept for that pavilion. Artwork from the 1977 Walt Disney Productions Annual Report, showing what Baxter's version of The Land may have looked like. Author Tim O'Brien says that Baxter believes this was the"best thing he was a part of that never got built." Our tour ended outside The Land pavilion, where our hosts (and some of the tour guests) pointed out the subtle difference between the two tile murals on either side of the entrance to that pavilion. Can you find the one different color tile on these otherwise mirror images of one another (ignoring the slight differences in how the photos are cropped and the position of the glass covering part of the mural)? RetroWDW hosts Todd McCartney, Brian Miles, How Bowers, and JT Kuzior never miss the opportunity to pose for a photo in front of some wall carpet. This was my second tour with the folks from the RetroWDW podcast, having joined the hosts for their Lake and Lagoon tour last November, and both tours have been enjoyable experiences. I had heard some of the stories they shared, but even hearing something familiar takes on an added relevancy when you are standing in the spot where that piece of history once took place. 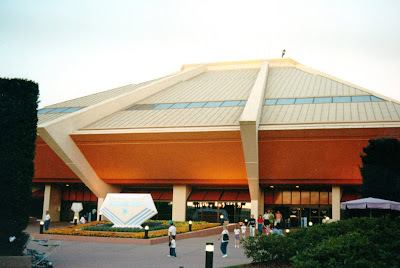 For me, this tour was more about the nostalgia of remembering the EPCOT Center I first experienced in 1983 (I shared photos of that visit if you'd like to see! 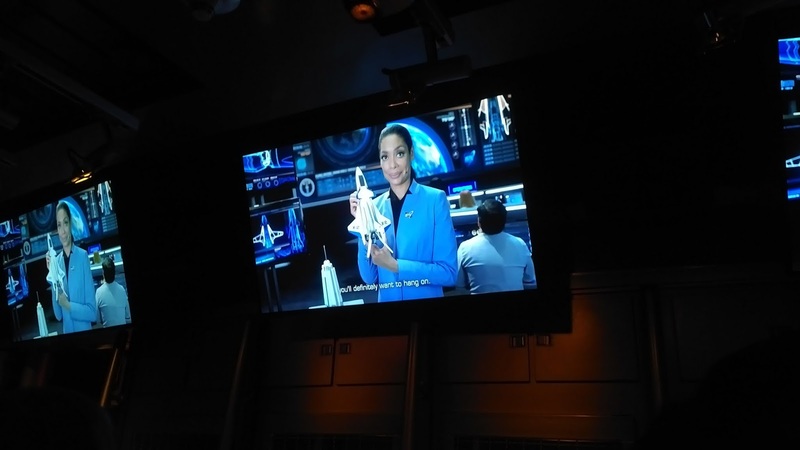 ), but the hosts still managed to find a few things I hadn't experienced myself, touch on topics I hadn't thought about in years, and add a few details from the D23 events they were attending that weekend. Add that to the chance to spend time with some fellow EPCOT Center fans and this was an hour and a half well-spent. I was excited to spend October 1st in Epcot this year. Over the course of 35 visits to Walt Disney World and more than 150 nights on and around Disney property, I had never before found myself in a Disney park on the anniversary of the Magic Kingdom (opened October 1, 1971) and EPCOT Center (opened October 1, 1982). Having watched the celebration of Epcot's 30th anniversary from afar five years earlier I was fortunate to attend the park's 35th anniversary celebration in person this year. For those who couldn't join me or those who wish to remember the day in the parks, I will recount my experiences being part of Epcot's 35th anniversary below. My day began early, with a 7:00 AM alarm, and I managed to drag myself out of bed after only one tap of the snooze button. A long night celebrating Epcot's anniversary with friends the night before kept me awake until well after 2:00 AM, so I didn't plan to start today early enough to be near the front of the crowds for rope drop, but I figured to still be in the park before it officially opened. I had already seen pictures from some Disney bloggers outside the park, positioning themselves to be at the front of the merchandise lines, before I even got into the shower, so leaving my hotel room at 8:12 meant that I knew I'd have quite a bit of company when I did arrive. Over the course of this trip, I would spend time with more than a dozen friends, but only one of them chose to join me for rope drop this morning. Since her hotel was on the way to Epcot, I stopped to pick up Sue, only adding a couple minutes to my morning drive, and we left her hotel by 8:21. 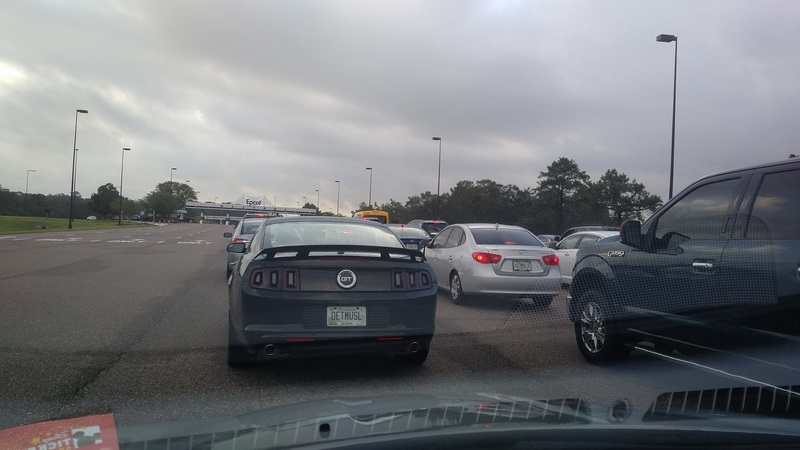 Fortunately, being a Sunday meant there wasn't much regular rush hour traffic, so it was smooth sailing to Epcot, at least until 8:30 when we found quite a few other cars waiting to enter the parking lot. Still, despite the backup at the toll booth, we were parked in a pretty good spot in the Amaze lot at 8:38 AM We made it through bag check and to the Passholder line tapstiles at 8:47, but noticed they weren't letting any more people into the park. That seemed like a bad sign, but after a few minutes, guests must have filled in more available space and the line started moving again. We entered the park at 8:51 AM. We picked up our commemorative buttons, park maps, and times guides, and then joined in with the crowds. The center pathways into the park were pretty well packed, but I noticed we could get relatively close to the "rope," which hadn't dropped yet, if we took the far right path, near where you would find character meets on most mornings. We were still behind a lot of other guests, but after a few minutes when we started walking, we were ahead of more people than we were behind. 8:53 AM - Guests were still held at Spaceship Earth. We passed all of those folks standing in the middle. 8:58 AM - It was decision time. We had been absorbed into the Mouse Gear Pop-up Shop Line, but could work our way to the left if we wanted to head to attractions. I hadn't really planned on joining in the merchandise madness on this day. I didn't see any of the "I Was There" items, which were only available this day, that I really needed to have and since I've never sold anything on eBay I didn't figure I was going to pay for my trip selling things that I bought. However, since we ended up much farther to the front of the pack than I expected after arriving so late, I figured I'd see how the line progressed. We were already inside the abandoned Innoventions West building that was housing the one-day only store by 9:01, so we might as well get the full Epcot anniversary experience. Sue didn't share my curiosity for how this process worked, so she left to explore the rest of the mostly empty park, walking on to Soarin with only a minimal wait and eventually finding a good spot to watch the special 35 Anniversary ceremony. I was enjoying conversation with a woman from England (I think she may have been from Bath), who was just starting a three week vacation in the U.S. Through the human traffic jam we found ourselves in, I learned the morning commutes sound very similar in the U.K. to what we see in this country, except that you sit in traffic on the opposite side of the road. 9:46 AM - I could see the backside of what was for sale. Around 9:52 AM I opted to join a line for those just purchasing pins. I figured this would be faster than the line for all merchandise, but I was still standing at this point at 10:05 AM when I saw the woman from England I was talking with in line leaving the store with her merchandise. 10:05 AM - At least I could see the pins. A Cast Member was trying to keep things moving, checking Annual Passes for discounts and handing everyone the pins they requested (you could buy 1 or 2), though things still didn't seem to be moving that quickly, then came to a complete stop when the one clerk handling the pin only purchasing ran out of cash register tape. We were quickly diverted to another register, but the whole shopping experience took longer than it should have. 10:13 AM - I survived the merchandise line and saw the 35th Anniversary Ceremony, which started at 10:01 AM, was still going on. 10:15 AM - I followed the signs and CM instructions for where they wanted people to walk, but wasn't going to be able to see anything from here, either. Since Sue said she was near the entrance to Mouse Gear (on the opposite side of the masses) I decided to double back and walk on the other side of the Fountain of Nations and see if I could get anywhere near the stage. 10:19 AM - There was quite a line to get into the Pin Station + I wasn't sure why, since I didn't think they were selling any pins only available this day. 10:20 AM - More of the pin line. I don't know where it ended. 10:24 AM - I felt pretty clever when I walked through the trees and found myself relatively close to the show, arriving just in time to hear the Voices of Liberty perform a medley of songs from Epcot's past. 10:36 AM - Since this was both of our first visits since the new version of Mission Space opened, Sue and I decided to see what Mission Space Green was like. There's no Gary Sinise, but his replacement seemed to have everything under control and I found the new flight over Earth to be more pleasant than the previous Mars mission (though, still far from spectacular). 11:03 AM - Back to the front of the park to meet our friend, Shay, who was renting a wheelchair to get around the park. You can see the line for merchandise wrapped around all the way past where were entered the park in the morning. Another look at the line for the Pop-up Shop. I didn't follow it all the way to the end. After the Anniversary ceremony finished, there weren't any more official Disney events scheduled until Illuminations at the end of the night, so it was time to explore the Food & Wine Festival. This was likely to be my only visit to the Festival this Fall and I missed the chance to visit food booths the night before, because I didn't think I would enjoy doing so in a steady rain. I wouldn't be able to even make a dent in the list of items I wanted to try, but at least I'd have the chance to sample some booths that weren't around during any of my other Food & Wine visits. While eating, we were joined by more friends, Karen and Kim, who had chosen to take a more relaxing start to the day. We all talked ourselves into buying commemorative glowing plastic drink vessels, which were only available today (while supplies lasted). 12:22 PM - We all had Frozen Ever After FPP for 11:20 - 12:20, so we meandered over the Norway, arriving just as the 15 minute grace period for our FPP window began. We stopped for PhotoPass photos outside the Germany pavilion, where I was surprised by a visit from one of Epcot's Food & Wine Festival chefs. 1:47 PM - When I find a beer with flavors I've never tried together before I want to taste it, so I ordered an Orange Blossom Brewing Foxtail Cold Brew Coffee Pilsner from the Hops & Barley booth outside the American Adventure. It tasted like a coffee-flavored pilsner, which was better than the lagers I had had thus far today. By 2:26 PM, World Showcase was looking like you'd expect on a weekend during the Food & Wine Festival. At this point, I wandered off from the pack to meet other friends, Brooke and Jason, who flew in that morning and had just arrived in the park. 2:49 PM - I caught up with Brooke and Jason, who were hungry after their travels and had already visited some Food & Wine booths. I ordered a Redstone Meadery Black Raspberry Mead from the Earth Eats booth so they didn't have to drink alone. 2:58 PM - at the Craft Beer stand inside the Odyssey, where someone in our group didn't notice that the cotton candy on the menu was just a big bag of cotton candy (and not some clever cotton candy flavored concoction). 3:01 PM - Time for one more drink before our 3:15 tour was set to begin. This was a JDub's Passion Wheat, which made no strong impression on me one way or another. Brooke, Jason, and I (and later, Kim) joined the cast of the RetroWDW podcast for a walking tour around Epcot, starting at the base of Spaceship Earth. If you're interested in more about that tour, then take a look at the article I wrote about the tour. 5:02 PM - I lost track of my friends at different points during the tour, but was ready for a short break from the park, so I started making my way toward the exit, though I did have time to photograph Figment, with his home in the background. Most of my friends were gathered to ride Spaceship Earth together, but I wanted to get back to my hotel room to retrieve my tripod and second camera to photograph and record video of the evening's performance of Illuminations. That turned out to be a good decision, as I later found out the flurry of group text messages I received indicated the ride stopped for an extended period of time, leaving my friends stranded in ancient Greece for long enough to attempt to translate their words (with questionable accuracy). I walked out of the park at 5:23 PM, was in my car a few minutes later and back to the hotel room just before 5:45. That left me time empty the Food & Wine Festival receipts from my pockets, shower, and gather my camera equipment before leaving the room at 6:56 PM. I parked in one of the first rows of the Create lot, on the side closer to the trams/walkway to the park entrance at 7:12 PM and was back through the tapstiles again at 7:23 PM. 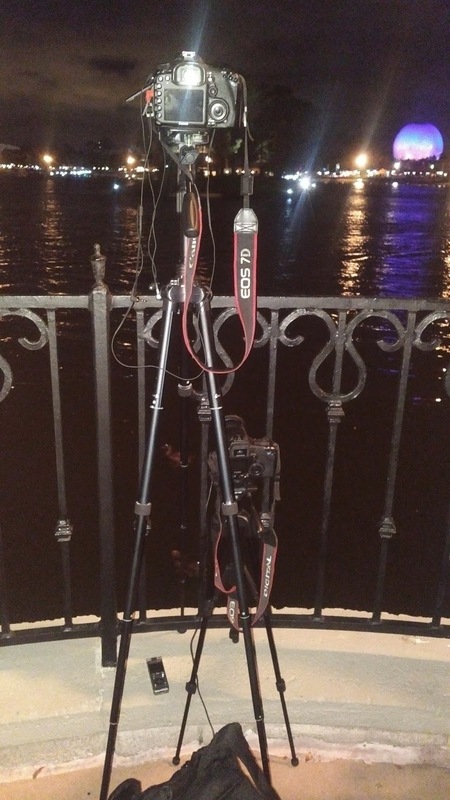 After picking up another "I was There" button, it was time for me to find food and setup to photograph the fireworks. 7:25 PM - Evenings in Epcot are one of my favorite parts of a Disney World vacation. 7:27 PM - There's still quite a line for today's merchandise, though it no longer stretches all the way to the front of the park. 7:35 PM - The Future World food booths were a pleasant surprise during this year's Food & Wine Festival. I went to Flavors from Fire primarily because it was conveniently located on my way to World Showcase, but was pleased with the quality of food and the availability of places to put down my selections to eat (and photograph). 7:51 PM - This seemed like a good time to take a moment to enjoy the Imagination fountains. Most of my group of friends had made FPP reservations with watch this evening's showing of Illuminations, but I've had mixed results photographing the show from the FPP viewing area. Normally, it's a great spot, as close as you can get to the projections on the globe, perfectly centered, but people tend to line up long before the show begins even on a normal night. I stopped by the viewing area on my way into World Showcase and not only did I find a substantial line of people waiting for the FPP viewing area to open an hour before the show (and a half hour before the viewing area was supposed to open), but also found the prime viewing spot was occupied by an enormous stage for the recording of an upcoming ABC television show. I realized I wasn't going to be able to setup my cameras near the rail (where they could be out of the way of other guests), so decided to move on. While I regret abandoning my friends for the evening's show, this turned out to be a good decision, as I heard folks were packed into the FPP viewing area and the speakers weren't working properly, so guests couldn't hear the music for the show very well. Having made my decision to seek another viewing spot, I started walking around World Showcase, only to find some of my favorite spots, near Mexico and Germany, already occupied. However, I stumbled upon a spot between the Germany and Italy pavilions that I was surprised to find only partially occupied. I was able to setup on the rail in between two families who were gathering to watch the show, one of which I found out had camped out at a table since late afternoon. The part of World Showcase closest to Future World is always considerably more crowded than the banks of the "back" of World Showcase Lagoon, but I was surprised at how relatively uncrowded this part of the park was on what had been such a busy day. I don't think the crowd was ever more than one person deep behind me throughout the show. 8:38 PM - I was already setup for photos and video, free to relax and get ready to enjoy the show. I only wish someone could've watched my spot so I could've had time to stop at another food booth! Since I was recording video with my newer DLSR, I brought my circa 2005 digital camera to photograph the fireworks show. The images aren't as good as with my newer camera, but I can still get serviceable images from my Canon EOS 20D. The regular version of Illuminations always looks good in pictures! Having no idea what the 35th Anniversary "tag" on the end of the show would look like, I didn't do a particularly good job of capturing that in still photos, but at least got one image that looked ok.
Around 9:45 PM, around half and hour after the fireworks show ended, I decided it was time to start walking out. I started moving toward Future World during the Universe of Energy song, and my timing seemed just about right, as the old Epcot songs abruptly stopped playing when that song ended, around 9:50 PM. No other background music kicked in, either, which gave me a few minutes having the unusual experience of being inside a Disney park with no background music playing. 10:02 PM - Just for the sake of curiosity, I decided to take another look in Mouse Gear. Some styles of t-shirts (including one I bought for myself the night before) appeared to be sold out and some generic Epcot mugs had replaced those with the Future World pavilion logos. Having wandered off on my own a couple times in the late afternoon and evening, I was happy to hear that most of my friends who were in town were gathered at Trader Sam's that evening. They were settled in outside on the Tiki Terrace when I left Epcot for the evening at 10:16 PM, walked to my car at 10:23, and was parked at Polynesian by 10:36 PM. As I arrived, the group was moving to the Grog Grotto, so I got there just in time to join everyone inside. After leisurely sipping two drinks and dropping some friends off at their resort, I was back to my hotel room by 1:05 AM, where I needed to pack to prepare to move to another hotel the next day. I also sorted through photos from the day's activities and eventually allowed myself to drift off to sleep. No monkeys were harmed in the writing of this blog posts, though some humans were disappointed to not be present for the day's festivities, including my friends Jennifer and +Harvey. Content from this site is provided by a few Disney fanatics. Read our first post to learn more about why we spend so much time thinking about Disney World. You can support this blog by using our Amazon.com referral link when you shop there! Copyright 2017 Robert Rowan. All rights reserved. Travel theme. Powered by Blogger.